CASCADE LOCKS -- Like all of his kind, sea lion C265 liked to eat fish. He was good at it, too. Ultimately that's what got him killed. Last month, C265 became the first California sea lion legally euthanized by the government since a landmark law protecting the pinnipeds passed nearly 40 years ago. It was the last of many firsts tallied by C265, whose life and death offer insight into a novel government program on the Columbia River that uses taxpayer money to kill one species in order to save another. In C265's death, specifically, questions persist about the effectiveness -- and appropriateness -- of the program. "We kind of call him our poster boy because he's been the first for so many things," said Robert J. Stansell, supervisor fish biologist for the U.S. Army Corps of Engineers at Bonneville Lock and Dam. In recent years, increasing numbers of sea lions have arrived at the dam to eat endangered salmon pooling below the concrete barrier on their way upstream to spawn. Fish managers are worried the marine mammals could eventually hinder ongoing, multibillion-dollar fish recovery work. C265 was among the vanguard of sea lions at Bonneville earlier this decade. He was often the first to show up and the last to leave on a given year, there like other males to fatten up before heading south to the rough-and-tumble rookeries in California's Channel Islands. "This food source is probably the best these animals could hope for to put on weight," said Robin Brown, program leader for marine mammal research at the Oregon Department of Fish and Wildlife. And C265 was a glutton among gluttons. In 2007, his weight nearly doubled -- from 556 to 1,043 pounds -- in about 2 1/2 months, most of which he spent at Bonneville. That year he ate about 43 salmon when roughly 85,000 passed through the dam's fish ladder. But a sea lion only has to be seen eating one endangered salmon by corps spotters posted at the dam for the states of Oregon, Washington and Idaho to get permission from the National Oceanic and Atmospheric Association to kill it. 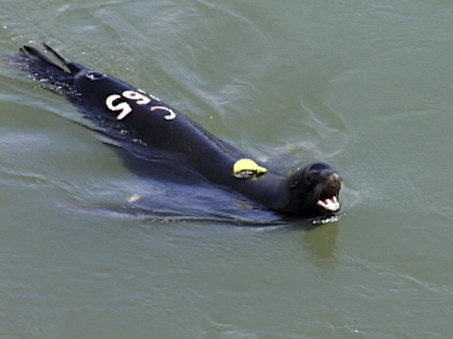 To be sure they have the right pinniped, spotters can reference a phone book-sized blue binder holding hundreds of pages of individual sea lions, complete with color photos, sketches of markings, identification numbers and even nicknames such as "Pirate" and "Crazy 8." In addition to being caught eating a fish, the animals have to have been seen at the dam for a total of at least five days, and they have to show resistance to hazing techniques such as rubber bullets and firecrackers. C265 (the C stands for Columbia) met all those criteria during his years in the Columbia River. He was first identified in 2002 while he was lounging on the docks at the Astoria waterfront. He was maybe 1 to 3 years old, said Brown, and had two distinctive white rings behind the left side of his head and another mark similar to the symbol for infinity near his tail. That April he was trapped, weighed, funneled into a squeeze cage similar to the one used for handling livestock, and branded across his rump. He has been a well-known figure on the river since then, and there are a few things besides his brand that those who have observed him say made him stand out. First, he was something of a loner. "He'd haul out on docks where other animals weren't," said Matthew Tennis, who heads up ODFW's trapping program in Astoria. And he barked a lot, even for a sea lion, one spotter at Bonneville recalled. "He was always really friendly, really gregarious. He'd stake out his territory, and when other sea lions would want to get near him, he was real particular about who would get near him," said Bethanie O'Driscoll, a member of In Defense of Animals' Sea Lion Defense Brigade. And by all accounts, he wasn't afraid of humans. That made him easy to trap but difficult to scare away from the salmon smorgasbord below Bonneville. Last fall, he showed up at the dam again, the first time a sea lion had been there that long before the spring Chinook run began. But by March the state had the right to kill sea lions with guns or lethal injection. The state has a list of 73 animals approved by NOAA for lethal removal. Seven sea lions have been killed so far. Oregon Fish and Wildlife spends about $200,000 a year on this sea lion program, while the U.S. Army Corps of Engineers spends between $400,000 and $500,000. In Defense of Animals recently asked a judge in Portland to halt the killing of sea lions because the group says the corps' records show it had the wrong animal in one case, calling the whole program into question. But the judge denied In Defense's request. "Although there are some individuals that can be recognized, it seems ridiculous to believe on its face that the state can recognize the 250 individual sea lions they claim to recognize without any brands," said Matthew Rossell, Northwest director for the group. The group and others are repulsed by the idea that sea lions are targeted to protect salmon, and they argue that more attention should be focused on the root causes of salmon's decline, such as the loss of habitat and the dams themselves. The fish the sea lions are seen eating at Bonneville account for between 0.4 and 4.2 percent of the annual spring Chinook run, less than is allowed for fishermen. But those are only the observed sea lion takes, and sea lions don't discriminate between hatchery and wild fish. "This is really a tragic program, and it's not going to do anything to save salmon," O'Driscoll said. The end for C265 began last month when he was trapped below the dam. He was transferred to a cage and taken to an undisclosed building on the dam project site. On March 12, he was given a shot of sedatives and then administered an anesthetic gas to put him to sleep. His blood was drawn, and he was examined for lesions that are indicative of a genital cancer that has been showing up in Columbia River sea lions. "C265 had lesions all over him," said Brown. "He clearly had a bad case and would not qualify for a zoo." The agencies were able to find homes for only seven sea lions this year, and four of those spots are already taken. So while C265 was still asleep from the gas, he was given a lethal dose of sodium pentobarbital, a barbiturate commonly used by veterinarians for animal euthanasia, Brown said. He died shortly thereafter. The animal's skeleton, Brown said, will be saved and articulated and used for research. His flesh was hauled away to Darling International's rendering plant in Tacoma. Because of the way their bodies store toxins, "adult males aren't edible," Brown said.